Virginia’s expansive woodlands, famously blue-tinged mountains, and rambling scenic byways are the place to be when colorful autumn leaves are at their fiery peak. Fortunately for seasonal color seekers, the Old Dominion state is also sprinkled with state parks, national forests, and vast wilderness areas. For those to prefer to do their leaf-peeping on foot, Virginia boasts a staggering 554 miles of the Appalachian Trail—more than any other state. When you are ready to seek out some fall color, take to the state’s wild spaces, and cherish the seasonal transition at these 10 stunning Virginia locations. 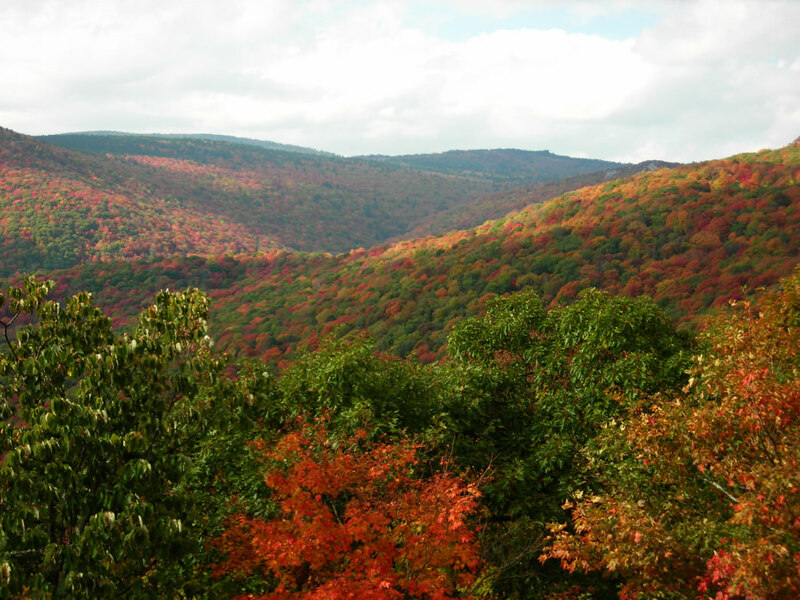 Southwest Virginia serves as an excellent starting point to explore the foliage. Abingdon is one of several small mountain towns that offers easy access to both cultural amenities and stunning outdoor vistas, perfect for a weekend getaway. 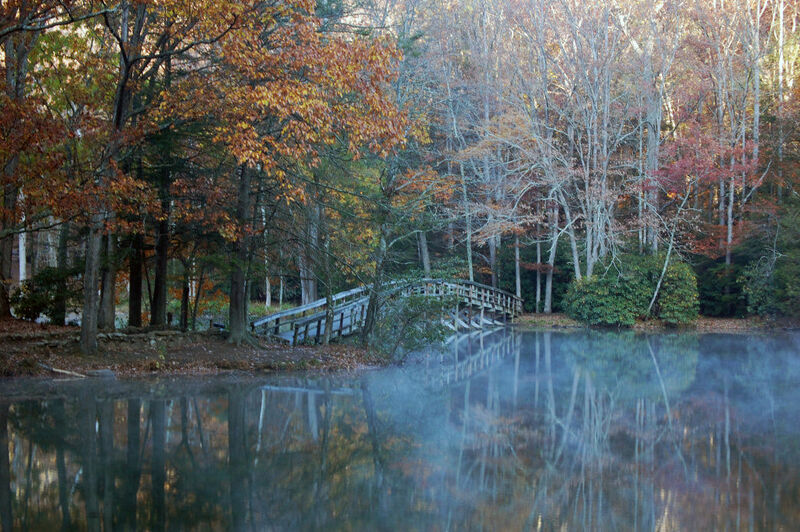 Take the time to enjoy the spectacular transition of fall at these 10 Virginia locations. One of Virginia’s most unique places, the highland meadows, dense forests, and panoramic summits of Grayson Highlands State Park are still the domain of roaming bands of wild ponies. The park also straddles the massive Mount Rogers National Recreation Area – offering color-seeking autumn visitors sweeping views of some of the largest undisturbed wild spaces in the state. For a short hike with endless Blue Ridge vistas, trek the mile-long Rhododendron Trail—you are also likely to be sharing the path with the park’s famous hoofed residents. One of the most spectacular corners of Virginia, the 200,000-acre Mount Rogers National Recreation Area, part of the massive Jefferson National Forest, is spread over a picturesque, high-elevation pocket of Southwest Virginia, sprinkled with alpine meadows, vast tracts of mixed hardwood forest, and the famed “bald” peaks of Appalachia. The Mount Rogers Scenic Byway, flanked by towering forests, winds gracefully through the massive wilderness area. However, if you prefer a self-propelled leaf-peeping tour, 60-miles of the Appalachian Trail meander through the highlands of the Mount Rogers National Recreation Area, which boasts views of the two highest peaks in Virginia—the 5,729-foot Mount Rogers and the 5,518-foot Whitetop Mountain. Spreading into Washington and Russell counties, 4,836-acre Channels State Forestis one of Virginia’s best kept secrets—and a most exceptional natural space. In the fall, visitors can admire not only the fiery reds and burnt oranges of the protected area’s mixed hardwood forests but also can hike to the namesake channels. The 400-million-year-old sandstone formations are nestled into the southern slope of Clinch Mountain, near the summit of Middle Knob. For shutterbugs, the labyrinth-like, ice-age-era geological formations provide a singular backdrop for any attempt to photograph seasonal color. The rapidly changing fall foliage looks perhaps even more stunning in the glassy surface of the 60-acre Hidden Valley Lake, which is snuggled into the crown of Brumley Mountain, just outside the town of Abingdon, Virginia. Admire the vibrant seasonal transition on foot, hiking the wilderness management area’s network of trails, or set out from the boat launch along the northern part of the lake. If you are so inclined, the high-elevation lake is also popular with anglers in pursuit of smallmouth bass and northern pike. Boasting a 108-acre lake framed by a woodland-blanketed mountain backdrop, Hungry Mother State Park in Southwest Virginia is hardly short on scenery. The park is named for an early colonist, Molly Marley, who perished in the area while escaping Native American raiders targeting newly formed settlements along the New River. Admire the flaming hardwood forests shrouding the park with a 5.7-mile hike on the water-hugging Lake Trail loop. Or head for the 1.9-mile Molly’s Knob Trail, with the option to tack on the aptly named 0.4-mile Vista Trail. 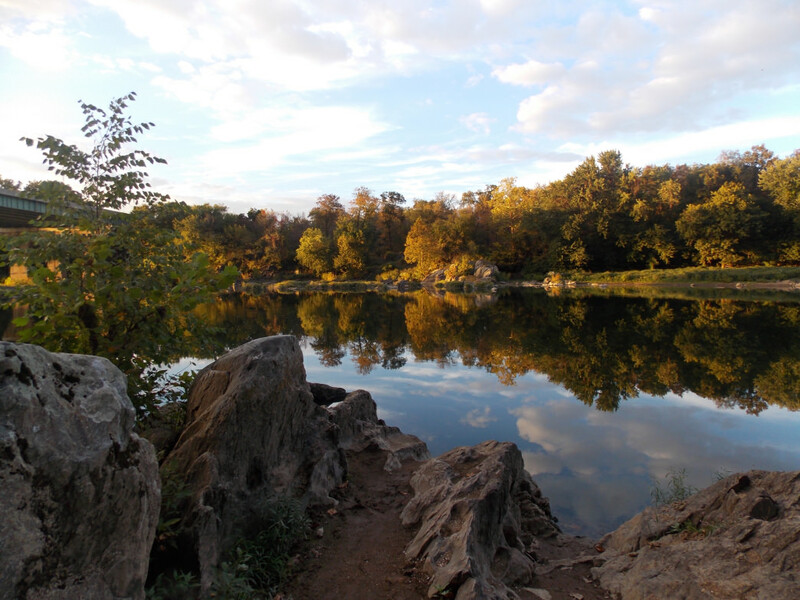 The bustling, urban, Washington, D.C., area may seem unlikely place to see autumn’s annual foliage fireworks, but the Northern Virginia section of the 710-mile Potomac Heritage Trail rambles through some of the most striking scenery in the northern part of the state, hugging the mighty Potomac River. For a stunning seasonal tour, hike the leafy 10-miles from Great Falls Park to Algonkian Regional Park, stopping to admire the river as it churns and tumbles through Mather Gorge. 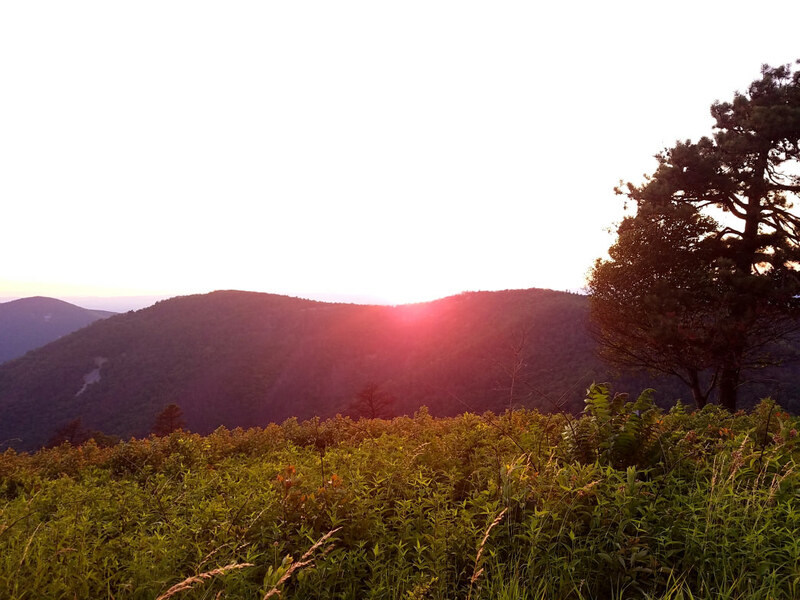 Sunset over Shenandoah National Park. Virginia’s 200,000-acre Shenandoah National Park is always a sure thing for fall color. The park’s primary artery—the 105-mile Skyline Drive—is one of the most breathtaking roadways in the state, meandering past a staggering 75 scenic overlooks. 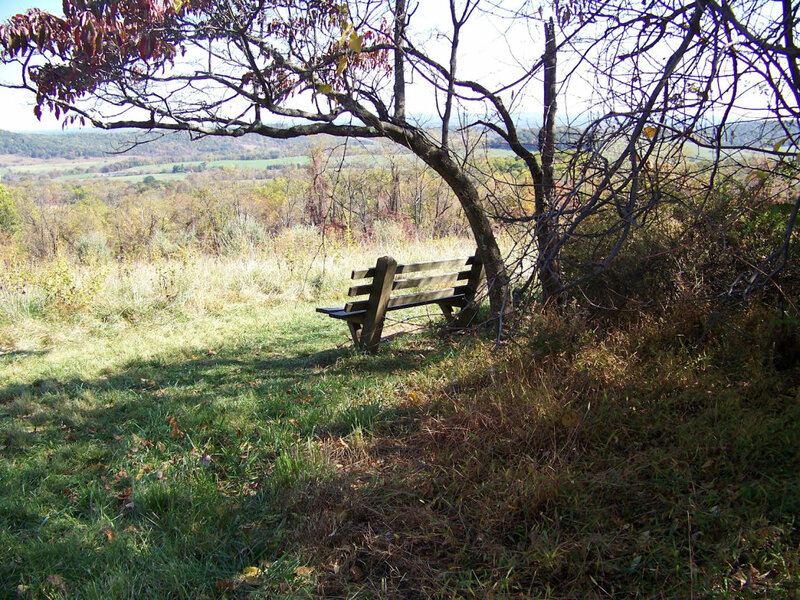 However, some of Shenandoah’s best viewpoints can only be reached by foot via the park’s nearly 500 miles of trails. Try hiking to Mary’s Rock, in the northern section of the park, with sweeping panoramic views of Thornton Gap, or make the grueling climb to the summit of Old Rag (just outside the park boundary, in Sperryville), one of the only free-standing mountains in the Blue Ridge. Summit-baggers will be rewarded with undisturbed 360-degree views. Spread over the rolling hills and lush pastures of Virginia’s “hunt country,” where weekends are still filled with horse shows and polo matches, historic Sky Meadow State Park is wedged between the rolling Blue Ridge Mountains and the Virginia Piedmont. Once a functioning family-farm, the 1,864-acre park is actually appropriately named for Scotland’s ruggedly breathtaking Isle of Skye. Scramble up the half-mile Piedmont Overlook Trail for seemingly infinite views of the Blue Ridge. You can build a longer circuit by linking the Ambassador Whitehorse Trail, the Appalachian Trail and the North Ridge Trail. Sky Meadows is also in the heart of Northern Virginia wine country, and tasting opportunities abound in the area surrounding the park. 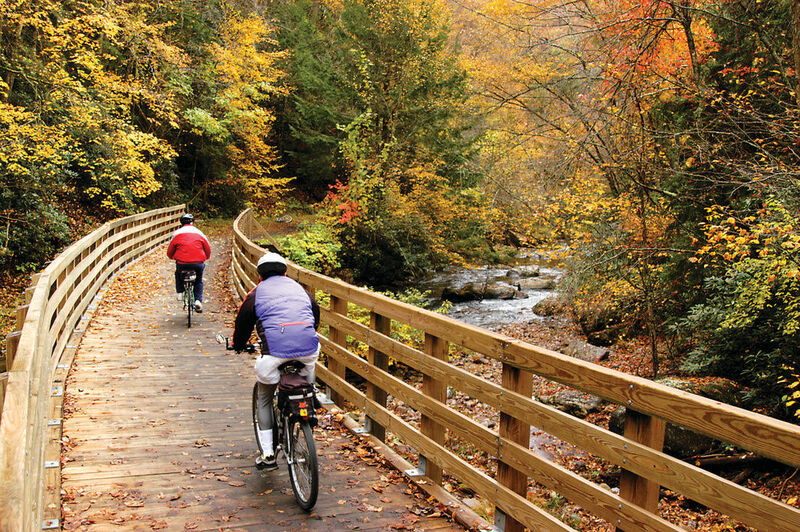 Ribboning through the Blue Ridge from Virginia south to the Great Smoky Mountains in Tennessee, the Blue Ridge Parkway is one of the East’s most picturesque drives—and in the fall, also certainly one of the most colorful. Just 5-miles south of the very first milepost on the parkway, the Humpback Rocks Recreation Area boasts some of the best vistas in the entire northern section of the Blue Ridge. Although the hike from the parkway to Humpback Rocks is only a mile, the trail ascends rapidly, gratifying climbers with views of the Shenandoah Valley and the Virginia Piedmont. The 5,726-acre Priest Wilderness, part of the massive George Washington National Forest, is one of the wildest spaces in central Virginia. The vast swath of pristine wilderness is crowned by the 4,062-foot Priest, part of Virginia’s “Religious Range,” and just one of eight peaks over 4,000-feet strung throughout the rugged section of Appalachian high-country. For ambitious hikers, the summit of the Priest can be reached on the Appalachian Trail either via a brief 1.5-mile climb from the Crabtree Falls trailhead, or by beginning at the Tye River trailhead—a route that ascends more than 3,000 feet in just 4 miles, making it one of the most grueling climbs on the entire Appalachian Trail. 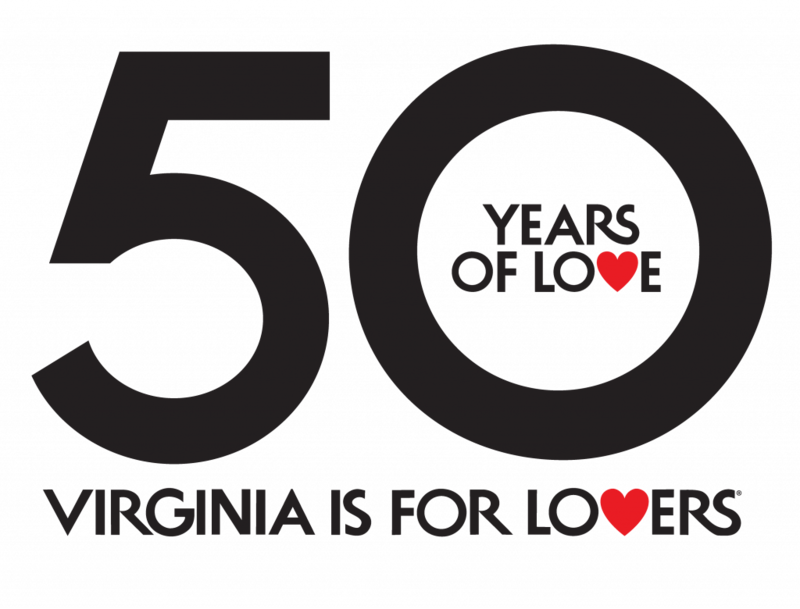 Originally written by RootsRated for Abingdon.